After driving hundreds of miles, the last thing Roy Williams, a truck driver from Denton, Tex., wanted to do was exercise. After a day trapped in the cab, stopping only to gorge on greasy fare at truck stops, who could think of working out? 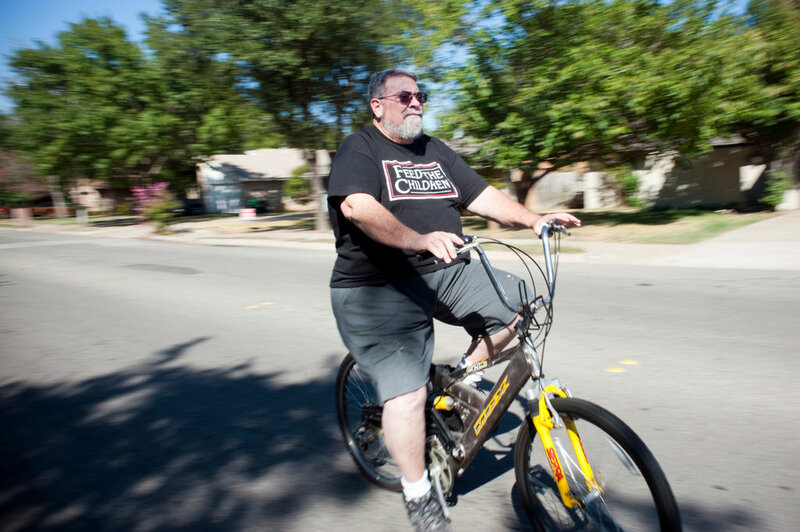 But once he ballooned to 405 pounds, he knew he had to make a change. So last year, Mr. Williams, 58, did something all too rare for someone in his profession: He embarked on a diet and exercise program. The six-pack of Coca-Cola he drank each day? Gone. The hamburgers, chips and chocolate he relished? No more. Today, he drinks a protein shake mixed with ice water or soy milk for breakfast, nibbles cantaloupe and red grapes, and makes “sandwiches” with thinly sliced meat and cheese but no bread. He keeps a fold-up bike in his truck and zips around rest areas on his breaks. His weight is down to 335 pounds, and he’s managed to reduce the amount of blood pressure medication he takes. “I rarely, maybe once a week, even go into a truck stop,” said Mr. Williams, who has been navigating an 18-wheeler for the last 30 years. Mr. Williams’s predicament is hardly unique. On the road for weeks on end, with the sorts of diets that make nutritionists apoplectic, the nation’s truckers are in pretty bad shape. Now, beset by rising insurance costs and desperate to ensure their drivers pass government health tests, trucking companies and industry groups are working hard to persuade road warriors to change their habits. It’s a long haul, so to speak. Eighty-six percent of the estimated 3.2 million truck drivers in the United States are overweight or obese, according to a 2007 study in The Journal of the American Dietetic Association. “Obesity is a terrible problem in the trucking industry,” said Brett Blowers, director of marketing and development for the Healthy Trucking Association of America, an industry organization in Montgomery, Ala.
A few years ago, Mr. Blowers’s group conducted a blood pressure screening of more than 2,000 drivers at an annual truck show. “We sent 21 directly to the emergency room, and one of them had a heart attack on the way there,” he recalled. It’s a problem not just for truckers, but for anyone who shares the road with them. In 2010, heavy and tractor-trailer truck drivers accounted for 13 percent of all fatal occupational injuries, according to preliminary data from the Bureau of Labor Statistics. A 2007 report from the Federal Motor Carrier Safety Administration found that 87 percent of crashes involving truckers stemmed to some degree from driver error. Twelve percent of these cases were because the driver was asleep, had a heart attack, was in diabetic shock or had some other health problem. “Of the accidents that are preventable, I’d say about 10 to 25 percent, if not higher, were from drivers who were tired, had sleep apnea or were not physically fit,” said Chad Hoppenjan, director of transportation safety services at Cottingham and Butler, an insurance broker in Dubuque, Iowa. The United States Department of Transportation requires drivers to pass a certifying medical exam every two years. Drivers are checked for severe heart conditions, high blood pressure and respiratory maladies, including sleep disorders. While the statistics are bleak, they’re not especially surprising. Driving is a sedentary activity. Most truckers are paid by the mile, so they tend to squeeze out every last second of the 11 hours they’re allowed on the road in a 24-hour period. “Some days I’ve driven 600 miles and didn’t even stop,” said Barb Waugh, 58, of Fairfax, S.D., one of an estimated 190,000 female truckers. In a typical week she logs 2,500 to 4,000 miles. ”I feel like a marshmallow because I don’t get to exercise,” said Ms. Waugh, who weighs about 300 pounds. Routines that keep other Americans healthy — hitting the gym, cooking at home, scheduling a doctor’s appointment — are nearly impossible, since drivers are rarely in one place for more than a day or two. The only exercise for many is pressing the gas pedal; most don’t load and unload cargo. “Everything’s fried, fried, fried — chicken, hot dogs, hamburgers, chili, burritos, corn dogs,” said Bill Johnson, 50, of Lubbock, Tex., a 25-year industry veteran. Until recently, few in the transportation industry cared to tackle its health issues. “When you tried to talk to someone to connect the dots, they looked at you like you had three heads,” said Bob Perry, founder of Rolling Strong, which offers health and wellness programs for truckers. Now transportation carriers, industry organizations and even truck stops are unrolling initiatives to help truckers slim down, shape up and improve their health. Employers are holding health seminars, building on-site gyms, bringing in nutritionists and fitness trainers, and offering financial incentives to employees who stop smoking or lose weight. Some drivers are cooking in their rigs, walking or bike riding around truck stops, blogging about their experiences at sites like truckingsolutionsgroup.org and safetythruwellness.com, and writing books. Lindora Clinic, which operates weight-loss centers, last year unveiled “Lean for Life On-the-Road,” a nutrition and exercise program for the trucking community. The company has teamed up with the Truckload Carriers Association, which represents 400 carriers, for a “Trucker Weight Loss Showdown” to begin in January. For two and a half months, 10 fleets, each composed of six drivers and six office workers, will exercise and follow low-carb, low-fat, moderate-protein diets. This year, TravelCenters of America/Petro unrolled a program called StayFit, which includes fitness rooms, mapped walking trails and healthier foods at its stops. Snap Fitness, an international chain of 24-hour gyms, has announced plans to open a workout facility at one, and perhaps many more, of the 550 Pilot Flying J Travel Centers across the country. While concern for driver health is certainly a force behind the wellness initiatives, economics also plays a role. The trucking industry is grappling with sky-high insurance rates and rising medical costs. The 2010 Cottingham and Butler Trucking Compensation and Benefits Benchmark Survey, an annual report for the trucking industry, found that deductibles and out-of-pocket costs to truck drivers and their employers are 40 percent to 70 percent higher than in other industries. “It just keeps going and going, and you don’t know how to control it,” said Sidney Brown, chief executive officer of NFI, a logistics company in Cherry Hill, N.J. To help cut costs, his company has started quarterly wellness newsletters, free smoking cessation workshops, discounts with WeightWatchers and Anytime Fitness, and a companywide “Biggest Loser” competition. The industry also is struggling to retain veteran drivers while recruiting new ones. According to Debbie Sparks, vice president of development for the Truckload Carriers Association, the industry is short about 150,000 drivers, and she expects that number to rise to 300,000 by next year. But nearly 40 percent of new drivers quit within their first 90 days. “We’ve got to make ourselves more attractive to recruit a new generation of truck drivers,” said Ms. Sparks. Some of these programs have had modest success. Con-way Freight, based in Ann Arbor, Mich., has hired 46 full-time wellness coaches who rotate among 110 facilities. The company has seen a 32 percent reduction in workdays lost to injury, said Bob Petrancosta, its vice president of safety. Several years ago, Trucks Inc., a regional carrier in Jackson, Ga., shifted to an annual Department of Transportation physical rather than bi-annual. It has since saved more than $250,000 in medical insurance costs diagnosed several pre-heart attack and pre-diabetic conditions among drivers. And a sleep apnea treatment program at Schneider National, based in Green Bay, Wis., has saved the company $651 per driver per month in health care costs since its inception in 2003. Still, it’s likely to be a long time before truckers are clamoring for steamed tofu and doing Sun Salutations at rest stops. “Unless the driver is scared to death for their life, unless they’ve had a medical event, they’re probably not going to change,” said Michael Metzger, 37, whose Web site, Healthy Trucker Lifestyle, chronicles his weight-loss experience (70 pounds and counting) and offers recipes and exercise tips for drivers. But slowly, she said, drivers embraced the company’s 10-week program, which includes weekly phone consultations with a “nurse coach” and costs $360 a person, often paid wholly or in part by the employer. So far, the 75 drivers who have completed the program have shown an average loss of 8.4 percent from their starting weight. Mr. Johnson signed up with Lindora this summer after hitting 226 pounds. Beforehand, his only exercise was “walking into the truck stop restaurant, eating a bit and going back to the truck,” he said. Today he weighs about 208 pounds, and his truck doubles as a makeshift gym. He does sit-ups inside the trailer and pull-ups below. He fills a cooler with 60 pounds of ice and lifts it over his head 10 to 15 times. He power-walks around truck stops, some of which cover four or five acres, though he balks at the idea of using the area around his truck as a running track (32 laps around a rig is a mile, drivers are sometimes reminded). “That’s just goofy,” he said. Two years ago, he began working with Chadwick Slagle, a trainer. Together they devised a nutrition plan: Mr. Melton now eats five meals a day, drinks water instead of soft drinks, and snacks on fruit and nuts. He wakes up at 4:30 a.m. to exercise, running on a treadmill or around a parking lot. He now weighs about 200 pounds and hopes to get down to 190. For Ms. Garcia, who recently joined WeightWatchers, a new lifestyle was an easy decision. She takes medication for high blood pressure, and she worries that the day will come when she won’t pass her physical.